Born in Yubetsu, Hokkaido; 1916-1993. The third son and successor of Sokaku Takeda, Tokimune Takeda began training in the martial arts under his father in 1925. He completed the Hokkaido Police Officer Training Course in 1946, and in 1947, a police course in stick handling techniques. While a member of the police force, Tokimune received several awards for outstanding service in arresting criminals. He joined the Yamada Fishery Co., Ltd., in December 1951 and worked there until his retirement in 1976. Tokimune established the Daitokan dojo in Abashiri, Hokkaido in 1953, and organized the Daito-ryu techniques, incorporating into them elements of Ono-ha Itto-ryu to create his own Daito-ryu aikibudo. He received the Cultural Social Education Award from Abashiri City on November 3, 1987. The following text is a compilation of several interviews conducted with Tokimune Takeda between 1985 and 1987 in Abashiri, Hokkaido and Tokyo. When was the term aikijujutsu first used in Sokaku's enrollment books? I think that aiki was taught as a self-defense art beginning a long time ago, during the Tokugawa period. Among the Daito-ryu jujutsu techniques is a particular type of aiki technique that we call hanza handachi. Techniques that were studied for use in the palace are called oshikiuchi. In the old days when people passed into the obanbeya of Edo castle, all of their swords were taken away. Everyone--except for those nobles of a certain rank, who were allowed to keep their short swords--had to surrender all of their weapons. They had to walk on their knees in front of the family of the Shogun. The hanza handachi techniques of the Daito-ryu were used during that period in response to any situation that might arise. Then hanza handachi must be an important part of the Daito-ryu curriculum. Yes, that's true. Knee-walking (shikko) is a basic skill in Daito-ryu. Hanza handachi techniques are based on knee-walking as well and are used against sudden attacks while seated. Techniques begun from a seated position and finished while standing exist only in Daito-ryu. Other classical martial arts do have techniques for controlling seated opponents, but only in Daito-ryu do you learn to throw your enemy in five directions in the process of standing from a seated position. We use the term goho, which means five directions, and thus the technique is called gohonage. In gohonage, you throw your enemy in five directions--front, back, right and left and center--that is, wherever you have just been. This sort of technique is unique to Daito-ryu. There are also five-directional throws associated with ikkajo, nikajo, and sankajo. Did the Aikido term shihonage come from Daito-ryu? That's right, and so did kotegaeshi. We call that technique aikinage. It is one of the aikinagetechniques. Would you talk about some of the basic Daito-ryu techniques like ippondori? Ippondoriis referred to as kogusoku in Ono-ha Itto-ryu, and a kodachi (short sword) is used. You thrust up from below when you are attacked by an opponent with a sword. In Daito-ryu, as an opponent swiftly attacks by grabbing you by the chest, you hold him down. The technique applies in situations where the enemy thrusts at you and you control him. What is different from other schools is that you hold the opponent down using the knee. Then you grab the opponent's hair in order to cut off his head. This is true Daito-ryu technique. You may wonder, "What meaning does this have in this day and age?" But this is basic to Daito-ryu. If you hold an opponent down with your knee, both of your hands are free. Then you can cut his throat. You must remain alert until then. Even situations with multiple attackers can be handled with your free arms because one attacker has been pinned under your knee. This is the essence of Daito-ryu. If you hold an opponent down with your entire weight concentrated on your knee, the enemy cannot rise. Each and every technique is lethal. None of the techniques give the opponent any openings. Daito-ryu teaching methods are completely different from those of other schools. Our techniques use real swords for serious combat. When Daito-ryu was used in the police department, the police gradually stopped practicing in this way, and they began to just gently hold the opponent down. Even during the Meiji era, people no longer controlled their enemies in order to stab them and cut off their heads. However, the essence of Daito-ryu is to keep alert until you have cut the enemy's throat. Thrusts must be made immediately. We strictly teach students of Daito-ryu these things. So practice is violent, and a little different from other kinds of practices or from just practicing softly with aiki. Could you explain in a little more detail about the concept of aiki? Aiki is to pull when you are pushed, and to push when you are pulled. It is the spirit of slowness and speed, of harmonizing your movement with your opponent's ki. Its opposite, kiai, is to push to the limit, while aiki never resists. Aiki applies to self-defense when an opponent attacks first, and we use the term to refer to self-defense for people in general. These two must not be confused. Thus, the police do not use the word aiki. They use jujutsu. They fight with kiai, using a sen sen attack. Attacking is kiai. Aiki, on the other hand, is go no sen. policemen are permitted to attack first. This is why the police studied Daito-ryu, though these days the mixture of judo, kendo, Aikido, and other arts used by the police is usually referred to as taihojutsu or arrest techniques. Would you tell us something about the seminars Sokaku conducted after he began his teaching career? He would teach for periods of ten days at a time, that is, one course lasted for ten days. It was not possible to spread the art systematically because, unfortunately, Sokaku spent his time traveling to teach and never established any branch dojos. Sokaku Takeda was not that type of person; at that time he was only interested in teaching. Students had to sign their names in the enrollment book each time they participated in a course. He never allowed Daito-ryu to be taught to people who were not his students. When did Morihei Ueshiba, the founder of Aikido, meet Sokaku for the first time? In 1915. I understand they met each other at the Hisada Inn in the town of Engaru in northern Hokkaido. It seems that Mr. Ueshiba came to Hokkaido to cultivate the land when he was in his thirties. He gathered together the second and third children of families--not the eldest sons--and they settled in Hokkaido. He was still young so I imagine it must have been quite difficult for him. Mr. Ueshiba studied Daito-ryu with my father from 1915 through 1919, about five years. He trained extensively and was enthusiastic. He was Sokaku's favorite student. However, I was the one who was scolded most frequently by Sokaku. After me, it was Morihei Ueshiba whom he scolded most often. Since I was Sokaku's son I wasn't so bothered when he scolded me, but I imagine that Mr. Ueshiba must have been greatly affected since he wasn't a member of the family. [Looking at accounting ledgers] Mr. Ueshiba really practiced quite a lot. This was the first time, here the second, and this the third. Here are the fourth, fifth, sixth and seventh times... Here is the eighth seminar where Mr. Ueshiba participated as Sokaku's assistant. All together, he had seventy days practice as a student. Here is yet another entry, the ninth time. This is quite different from earlier accounts of the connection between Morihei Ueshiba and Sokaku Takeda, isn't it? Yes. Mr. Ueshiba also accompanied Sokaku a great deal. Traveling with Sokaku was more significant than just studying with him during the regular practice sessions. And what's more, Mr. Ueshiba also taught as Sokaku's assistant. That's right. He started accompanying him from that time. Since Sokaku went to various places to instruct the police, judges, and that sort of person, Mr. Ueshiba probably thought that the art was wonderful and that he wouldn't have to continue farming if he mastered it. He was very devoted to Daito-ryu and also quite talkative. When Sokaku was teaching a group of judges and public prosecutors in Hakodate, Mr. Ueshiba happened to be his companion and assisted in teaching them. He was in his thirties then, and he was able to teach judges at this young age. Usually, it was quite difficult to rise to that position in those days. An instructor wasn't employed by the police unless he was descended from a samurai family. It was quite formal. So, it was a great thing to teach judges while so young. Morihei Ueshiba was a splendid person even at such a young age. Did Ueshiba Sensei become a certified instructor in Daito-ryu at that time? Actually, it was much later. He went back to Honshu [the largest of Japan's four major islands] before receiving it. It is recorded right here that he received his certification in Ayabe. If I remember correctly, my mother and I went to Ayabe, near Kyoto, when I was six years old. We stayed in Mr. Ueshiba's home, which was known as the Ueshiba Juku, for a long time. I would watch the training even though I was small. At that time there were forty students. Oh, here it is... This is the record of our stay there. We were there for about five or six months. Here, it says that the students of the Ueshiba Juku received instruction in Daito-ryu jujutsu under Sokaku Takeda Sensei. Many of the students were Omoto believers. Here, for example, is Masaharu Taniguchi of Seicho no Ie. Vice Admiral Seikyo Asano also studied Daito-ryu. These sorts of people also learned the art. Look at this, here is the name "Morihei Ueshiba." It is clearly written that the training ran from April 28 to September 15, 1922, quite a long time. Mr. Ueshiba was also teaching as an assistant then. Sokaku didn't like the Omoto religion very much so it seems he [sarcastically] referred to the house as Morihei Ueshiba's "villa." So Sokaku taught daily from April 28 to September 15? 1. When accepting students for instruction in Daito-ryu aikijujutsu be careful to choose persons of good conduct. 2. When instructing students, have them write their address, name, age, location of their dojo, and the terms of their instruction in an enrollment book and have them stamp it with their seal by way of authentification. 3. When instructing students, an initial payment of three yen should be made to Takeda Dai sensei as an enrollment fee. Everyone wrote the same words when receiving their assistant instructor's certificate. It is the same as setting up what we call today a branch dojo. Mr. Ueshiba practiced a great deal, more than anyone else. Did Sokaku go to Ayabe on Ueshiba Sensei's invitation? Actually, there were a number of people from the navy training in Mr. Ueshiba's dojo. All of the navy members had experience in sumo wrestling and were quite strong. Since Ueshiba would have had difficulty in handling such individuals he asked Sokaku Takeda Sensei to come. These men were huge, while Mr. Ueshiba was smaller than me. I would imagine that he wasn't able to pin them because he wasn't using precise techniques. After all, it would be difficult using only aiki. Could you tell us something about the relationship between your father and Morihei Ueshiba after Sokaku's stay in Ayabe in 1922? Since Ueshiba Sensei was one of Sokaku Takeda's best p upils and studied under him for a long time, I always used to visit him first whenever I went Tokyo, although I haven't been there since his death. I guess Sokaku Takeda loved Morihei Ueshiba best of all his students. Sokaku was terribly worried when Ueshiba was arrested in Osaka. He asked Yukiyoshi Sagawa and me to go see how he was managing. At that time, Ueshiba was under house arrest in Tanabe. When Sokaku heard that Ueshiba was all right, he was relieved. He was always concerned about Morihei. Sokaku trusted him a great deal, and would call out his name whenever he had a problem. Ueshiba was a diligent student. Did Sokaku Takeda Sensei give dan rankings? No, he didn't. I started giving them. Sokaku awarded transmission scrolls called mokuroku, ogi, and kaiden, but it's quite a lot of work to write and present such scrolls. So now we give out dan ranks, not scrolls. How many people have been licensed to teach Daito-ryu? Not very many. Most people do not practice long enough. A few people have notations written beside their names in our directory, such as "aikijujutsu," "aikijutsu," "ogi" or "nito-ryu." Usually people practice up through the 118 techniques. You must practice very hard in order to get a license. Would you give us your views of Aikido today? Aikido and Daito-ryu have different meanings. In Daito-ryu, once you have captured an enemy, you must finish him off with a second or even third technique. Techniques do not exist in isolation but are followed by second and third techniques. I have been watching Aikido techniques at the Nippon Budokan but I find that those demonstrating do soft techniques. They won't work in a real fighting situation. Their partners are only taking falls for them. It is as if they are practicing taking falls. If your partner takes a beautiful fall, it makes your techniques look good. In our practice we don't have our partners take falls. We practice throwing. There is no need for them to take falls. Menkyo Kaiden (Tokimune Takeda), 1988. Katsuyuki Kondo first learned Daito-ryu aikijujutsu from Tsunejiro Hosono and Kotaro Yoshida. He later studied under the late headmaster, Tokimune Takeda. Kondo was certified as a Daito-ryu instructor in 1974 and appointed soke dairi, official representative of the headmaster in 1988. He is an authority on swordsman, calligrapher, and Zen master, Tesshu Yamaoka. Kondo currently operates the Shimbukan dojo in Tokyo and has assumed leadership of the mainstream Daito-ryu organization following the death of Tokimune Takeda in 1993. The following text is an edited compilation of two interviews of Katsuyuki Kondo conducted in 1988 and 1992. Both of these talks took place before the death of Headmaster Tokimune Takeda in 1993, so there are a number of references to the state of his health at the time, as well as discussions of the future directions for the organization. Would you describe Daito-ryu aikijujutsu? It would be difficult to explain its entire history, so I will just summarize. About eight hundred years ago there was a man named Shinra Saburo Yoshimitsu, who resided in a mansion known as "Daito." He is considered to be the founder of Daito-ryu. His art was then transmitted through the Minamoto family line and then to their descendants, the Takeda family in Kai [present-day Yamanashi Prefecture]. After that it was handed down through the Takeda family as a gotenjutsu [martial art for use inside the palace]. In addition to this line, during the reign of the fourth Tokugawa Shogun, Ietsuna [1641-1680; shogun 1651-1680], Masayuki Hoshina of the Aizu clan, the fourth son of Hidetada, entered Edo castle as an instructor to the shogunal family and completed development of an art that came to be known as oshikiuchi. The Daito-ryu of the Takeda family and the oshikiuchi of Lord Masayuki Hoshina were transmitted separately. Then, in the Meiji period, Sokaku Takeda Sensei perfected Daito-ryu by combining the school of the Takeda family with the tradition of the Aizu clan. Thus, Sokaku Takeda Sensei is the father of modern Daito-ryu and should not be omitted from the history of the art. Sokaku Takeda Sensei was quite a unique martial artist in the sense that he traveled around Japan for many years instructing only persons of high social standing. What is more, he recorded all of this. I believe you are referring to the enrollment books and payments received ledgers he kept. As you pointed out, even from the early 1900s, Sokaku Takeda Sensei taught people such as the police and military officers, judges, and other influential persons in whatever town he happened to visit. Before that, the art belonged exclusively to the Aizu clan and was never allowed to be shown to outsiders. Sokaku Sensei was the first to teach it outside of the clan. In those days, teaching at a military institution or a police department was considered to be a sign of great status. This is because the military and police considered themselves to be the descendants of samurai. I think that while such a social hierarchy still remained during the Meiji period, it was quite difficult to have all these important people sign their names and affix their registered seals. What are the main differences between Daito-ryu and Aikido? I don't think there is any difference. In Daito-ryu, too, practice begins and ends with courtesy (rei). And its final goal is the spirit of love and harmony. I do not think that there is much difference technically, either. However, we have what we call ikkajo, which consists of thirty different techniques, ten of which are seated, five hanza handachi, ten standing techniques (tachiai) and five rear-attack techniques (ushirodori). Each of these thirty techniques has its own name. In Daito-ryu, the first technique you learn is called ippondori, a difficult technique where you receive, barehanded, the frontal attack of your opponent. In the traditional martial arts, a secret technique is usually taught at the very beginning. In Daito-ryu, too, we teach a difficult technique first. This ippondori, I believe, has become ikkyo in Aikido and also is related to techniques like shomenuchi ikkyo, katatedori ikkyo, ryotedori ikkyo, and so on. Ikkajo consists of thirty techniques, but only the ippondori technique became ikkyo in Aikido. There are twenty-nine other techniques such as gyaku udedori, kurumadaoshi, koshiguruma, and so on. Nikajo also has thirty techniques and only one of them is called nikyo in Aikido. And the case is the same for sankyo. Yonkajo includes fifteen techniques and one of them is called yonkyo in Aikido. Gokajo has thirteen techniques and one of them is gokyo in Aikido. It includes tasudori (techniques against group attacks), tachidori (techniques against a sword), jodori, kasadori, emonodori (techniques against various weapons) and so on, all of which were practiced in the old days. So we have 118 different techniques, classified as the ikkyo through gokyo series in Daito-ryu. These make up the hiden mokuroku and only five of those techniques were included in Aikido. I would like this to be clear, to avoid any misunderstanding. The difference between Aikido and Daito-ryu in the eyes of the general public is that in techniques of Daito-ryu you must break the balance of your opponent the instant you touch him. This is because there is aiki in the technique, which we use to break the balance of the opponent. This is a major characteristic of Daito-ryu. Another characteristic is its use of atemi. This atemi is also a part of aiki in Daito-ryu. Although it is often said that Daito-ryu looks unrefined or is lacking in magnificence, Daito-ryu also has a component called aiki no jutsu (fifty-three techniques) and they are truly wonderful. The aiki no jutsu techniques come after the 118 hiden mokuroku, and they are followed by the hiden ogi, the hiogi, the kaishaku soden, and finally the kaiden techniques. Since various names are used to refer to Daito-ryu, I believe there is some confusion. For example, terms such as Daito-ryu aikijujutsu, Daito-ryu jujutsu, aikijutsu, aikijujutsu, aikibudo and so on are used. Would you clarify the use of these terms? I understand that some people use the terms aikijutsu, aikijujutsu, or aikibudo in running their dojos. However, none of them has anything to do with Daito-ryu. All of the Daito-ryu schools recognized by the headmaster can be checked with him. We have and continue to use both terms, Daito-ryu jujutsu and Daito-ryu aikijujutsu, depending on the techniques taught. The present headmaster Tokimune Takeda Sensei calls the art Daito-ryu aikibudo since Daito-ryu is a composite art and should be practiced as a "Do" or "Path." Sokaku Takeda is a fascinating figure and is surrounded by controversy. Would you summarize his importance to twentieth-century Japanese martial arts? I consider Sokaku Takeda Sensei to have been a master without peer. I believe that without Sokaku Sensei, Aikido would not exist now. In other words, Sokaku Takeda Sensei of Daito-ryu should occupy a position of importance in the history of Aikido. According to one book I read recently, Daito-ryu didn't have much of an influence on Aikido and Morihei Ueshiba Sensei only studied the art for a short period. This is not true, since Morihei Sensei actually studied the art for a long time, from 1915 to 1937. He also received instructor certification in the art, that is, the kyoju dairi license and also the goshinyo no te scroll, which was the highes t level of Daito-ryu scroll awarded in those days. You cannot really say that twenty years of practice is a short period of time; twenty years out of one's life is quite a long time. 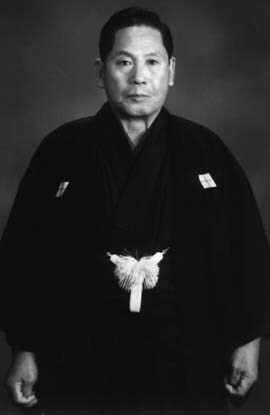 Although the Omoto religion was also related to the remarkable progress of Morihei Sensei in Aikido, I am sure that it is no exaggeration to say that without Sokaku Takeda Sensei, Aikido as we know it today would not have come into being. How do you view the relationship between Sokaku Takeda Sensei and Morihei Ueshiba Sensei? This is just my personal opinion, but Morihei Sensei studied Daito-ryu for over twenty years and served Sokaku Takeda Sensei as his master. Sokaku Sensei looked after Morihei Sensei as his student in various ways. There are many stories about this aspect of their relationship, illustrating the courtesy of a student towards his master and the affection of a master towards his student. This relationship continued for a period of time, and at a certain point Morihei Sensei began to seek his own path and eventually created modern Aikido. Morihei Sensei was a great person, and I believe that anybody who can be called great always exceeds his master. I do not know that Morihei Ueshiba Sensei exceeded his master, Sokaku Takeda Sensei, in terms of technical ability, but I think that realistically speaking, Morihei Sensei far exceeded Sokaku Sensei in terms of number of students and also the extent of his reputation. Sensei, you mentioned the designations kyoju dairi and soke dairi. Historically, what do the kyoju dairi and menkyo kaiden qualifications mean and who has been awarded these certifications thus far? There are quite a few people who received the kyoju dairi during Sokaku Takeda's time. Morihei Ueshiba Sensei was one of them. Also, there were Kotaro Yoshida Sensei, Kodo Horikawa Sensei, Toshimi Matsuda Sensei, Yukiyoshi Sagawa Sensei; all together I know of eighteen people who received the kyoju dairi from Sokaku Sensei. The kyoju dairi qualification is solely concerned with being able to teach on behalf of the headmaster. Therefore, receiving the kyoju dairi qualification means that a person may begin giving instruction as the representative of Sokaku Sensei or Tokimune Sensei. The branch dojo (shibucho) heads are qualified to teach only within their branch dojos under the umbrella of the headquarter's director, who is the headmaster. For example, the head of the Yokohama branch dojo cannot go to Saitama and teach. However, a holder of the kyoju dairi certification may do so. One can teach anywhere in Japan if he has received the kyoju dairi certification. The organization today is the same as in the past and one can instruct in place of the headmaster, currently Tokimune Sensei. This qualification is called either kyoju dairi or dairi kyoju. So if a person has received the kyoju dairi certification it means he has trained a great deal. What are the training requirements for receiving this qualification? One of the standards for receiving this certification is a knowledge of the goshinyo no te (self-defense) techniques. If a person has been taught through the goshinyo no te techniques, he may be awarded the kyoju dairi certification. In my case, I was taught the goshinyo no te techniques and received the kyoju dairi in 1974. I believe there are several steps before reaching the goshinyo no te, so I would imagine that these techniques are of a fairly high level. Yes. The first techniques one learns are the 118 techniques of the hiden mokuroku, and the next level includes the fifty-three aiki no jutsu techniques (omote and ura), the thirty-six hiden ogi techniques (omote and ura), the Daito-ryu aiki nito-ryu hiden techniques, and finally the eighty-four techniques of goshinyo no te, that is, jo (upper), chu (middle), and ge (lower). Kyoju dairi certifications were usually awarded after these techniques had been learned, but some of the teachers who received the kyoju dairi did not learn them all. What about the menkyo kaiden? Is it a much higher level than kyoju dairi? The menkyo kaiden means, as is indicated by the characters used, that all of the knowledge has been transmitted to the recipient, that everything in the system has been taught. In Daito-ryu, we have the kaishaku soden level which includes 477 techniques. After that one learns the eighty-eight menkyo kaiden techniques. People may think there are only two levels after the goshinyo no te, the kaishaku soden and then the menkyo kaiden techniques. However, in addition, there is another impo rtant body of knowledge in Daito-ryu--all of the Daito-ryu oral teachings and secrets. I can't express these in a few words, but they are something fundamentally important to Daito-ryu. In my case, it took fourteen years to go the two steps from goshinyo no te to kaiden. Who received the menkyo kaiden from Sokaku Takeda? Two people, Masao Tonedate and Takuma Hisa, received the menkyo kaiden from Sokaku Takeda.